Nest Hello Smart Video Doorbell (NC5100US) Wi-Fi White BRAND NEW! Video Doorbell to Monitor Front Door. Free Nest App. Person, motion and sound alerts. HD talk and listen. Two-Way Audio Communication. H.264 Video Compression. Free app download required. Quick response. 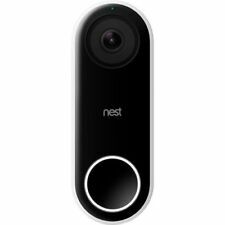 Nest Hello Smart Video Doorbell NC5100US. It is NOT battery powered. Custom Motion Zones. HDR Full HD Video. Trending at $185.72eBay determines this price through a machine learned model of the product's sale prices within the last 90 days. 1080P HD Lens & 166° Wide Angle; 2.4G Wi-Fi Connection & Two-way Audio; PIR Motion Detection & Night Vision; Free Cloud Service; Smart Night Vision; Two-way Audio; Easy to Installation. Trending at $48.34eBay determines this price through a machine learned model of the product's sale prices within the last 90 days. Rainproof: The doorbell can be installed outdoors, and you are no need to worry about it is drenched by rain. 1 x WIFI Doorbell. -Support WiFi. Monitoring: Device Button, Motion Detection, Remote Live View. This Nest Doorbell in new in opened box, unused. Beam Alert & Power Accessory Included. 1 x Doorbell Dingdong. Ding Dong Doorbell, can be matched with wireless video doorbell. Stylish appearance, touch design. Type US Plug. Sensitivity -110dbm. Transmitting power 0dbm. Power consumption 10W. 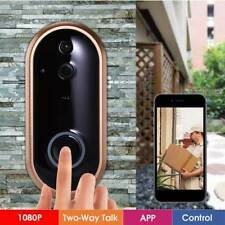 Wireless Smart WiFi DoorBell IR Video Visual Ring Camera Intercom Home Security. Our two plans, Basic & Complete, let you choose just the right amount of security for you. Have a professional monitoring team on your side, or manage your system by yourself! Batteries are included, as is a screw if you prefer that over adhesive. New Dingdong Doorbell Matched Use with Smart WIFI Doorbell Wireless Video Doorbell. It very easy to be paired with our smart Wi-Fi doorbell. 1 xUS Plug Ding Dong Doorbell. 1 x User Manual. Quality is the first with best service. NEW SkyBell Video Doorbell Camera Slim Line Alarm.com ADC-VDB105 Satin Nickel . Condition is New. Shipped with USPS Priority Mail Flat Rate Envelope. 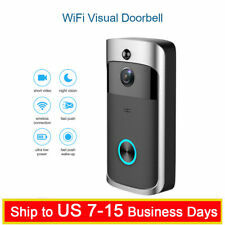 Ding Dong Doorbell, can be matched with wireless video doorbell. 1 x Ding Dong Doorbell. Also with the extra feature of a plug through which will allows you to still use the socket outlet for other electrical products, such as your vacuum. Rainproof: Doorbell can be installed outdoors, do not worry about being drenched by rain. 1 x WIFI Doorbell. - Support WiFi. Monitoring: Device Button, Motion Detection, Remote Live View. Audio: Two-way talk with noise cancellation. Set up your Doorbell in minutes with the included tool kit and installation guide. IOS, Android, Mac and Windows 10 compatible. Monitoring: Device Button, Motion Detection, Remote Live View. Audio: Two-way talk with noise cancellation. You can also place the video doorbell in living room or baby bedroom without installation and use it as security monitor. They can speak to this doorbell and ask for help if needed and also can get answered with 2-way audio function. WiFi Video and Audio Doorbell. 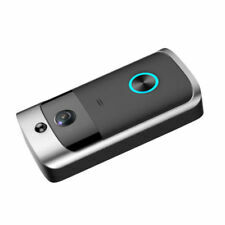 - 1 pcs WiFi Video and Audio Doorbell. - CD and Quick Setup Guide. - HD High Resolution 960P. - Power Consumption: 5 Watts. - 1 pcs Mounting Screw set. This doorbell provides HD quality Image with 166° wide v iew ing a ngle and intercom mode with clear two-way audio. It supports IR night vision, so that you can also have a clear view at night. It is easy to install without wires and cables.You are worth it! Rainproof: The doorbell can be installed outdoors, and you are no need to worry about it is drenched by rain. 1 x WIFI Doorbell. -Support WiFi. IR LED: 6 850mm. Intrusion alarm system. Monitoring: Device Button, Motion Detection, Remote Live View. This WiFi doorbell can connect home WiFi and achieve a two-way intercom between the doorbell and cell phone. Get one to make your life easier and safer! - Support PIR Motion detection to inform abnormal situation. 1 x WiFi Video Doorbell 1 x Mounting Screw Set 1 x User Manual. - High quality two-way voice intercom. 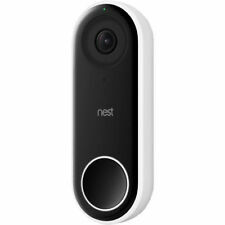 Nest NC5100US Hello Smart Wi-fi Video Doorbell. Condition is New. Shipped with USPS Priority Mail. Hello lets you know who’s there, so you never miss a thing. It’s designed. The doorbell you’ve been waiting for. With Aware, it can also let you know if. Night Vision. Makes other doorbells seem like dumbbells. 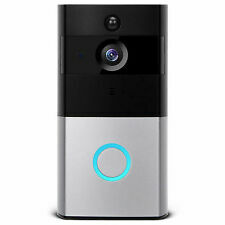 M11 2.4G Smart Wireless Doorbell. 1x Doorbell. High-quality two-way talk with noise cancellation. Infrared night vision. Remote capture. Million HD pixels collocated with the wide-angle lens. APP remote conversation. 1 x Doorbell Dingdong. Ding Dong Doorbell, can be matched with wireless video doorbell. Stylish appearance, touch design. Type US Plug. Easy to install. Sensitivity -110dbm. Transmitting power 0dbm. Product Specification 1 x Wifi Doorbell. Type Wireless Doorbell. Item Type Video Doorbell. Intercom Support. Wifi IEEE 802.11 b / g / n (2.4 GHz). High quality two-way talk with noise cancellation. This convenient device not only streams live video of whoever is at your doorstep, but the wi-fi video door bell allows you to converse, with its 2-way talk feature, using your smartphone, and from anywhere you are. Support the doorbell ringing indoor function. Indoor Doorbell Receiving distance: > 8m (26.25ft). 1 x EU Doorbell. Support full-duplex voice. Support free P2P cloud recording alarm information. Wireless WiFi Standard: IEEE802.11b / g / n.
"Features: With professional optical lens, million pixel HD camera with 166° view angle, never miss any details, built-in Chime sound to remind you. 2.4GHz wifi wireless connection, stable and reliable. Super long signal receive range up to 50m, it can through walls. Phone APP control, you can remote control to wake up the doorbell, and watch real-time videos directly from your smartphone no matter wherever you are, also support video playback. Two-Way audio and video communications, built-in speaker and microphone, allows you to communicate with visitors via two-way audio with noise cancellation..
Don't mute your phone. The doorbell is connected to the app through the sound wave. Detecting the slightest motion in front of the door. Protect your house like a guard. See, speak and hear through the app from your phone wherever you are. Open Box Item. What you see in my images is exactly what you will receive. I recently fully tested it to make sure it was working. It is in excellent working conditions. Note: You need to download the ToSee App on your iPhone from the App Store. Features: Wireless wifi connection, no any wires needed, connect to your home wifi, stable and reliable. Phone APP control, you can remotely control the doorbell, allows you to watch real-time videos directly from your smartphone no matter wherever you are. Two-Way audio and video communications, built-in speaker and microphone, allows you to communicate with visitors via two-way audio with noise cancellation. 166° wide-angle viewing, the scene outside the door is clear at a glance, never miss any details. IR Night Vision, built-in IR LEDs, 1MP HD image quality, up to 3m visible distance, effictivily protect your home even at night..
Rainproof: The doorbell can be installed outdoors, and you are no need to worry about it is drenched by rain. 1 x WIFI Doorbell. -Support WiFi. -Support picture snapping and video recording function.